Bartington Wharf is a minor waterways place minor waterways place place on the waterways major waterways place village town city on the Trent and Mersey Canal (Main Line - Middlewich to Preston Brook) between Anderton Lift Junction (Trent and Mersey) (3 miles and 4½ furlongs to the east) and Preston Brook (Junction of Trent and Mersey Canal and Bridgewater Canal (Preston Brook Branch) - immediately north of Preston Brook Tunnel) (3 miles and 1¼ furlongs and 1 lock to the northwest). The nearest place in the direction of Anderton Lift Junction (Trent and Mersey) is Acton Bridge No 209; ¼ furlongs away. The nearest place in the direction of Preston Brook is Ryan&apos;s Bridge No 210; ¾ furlongs away. 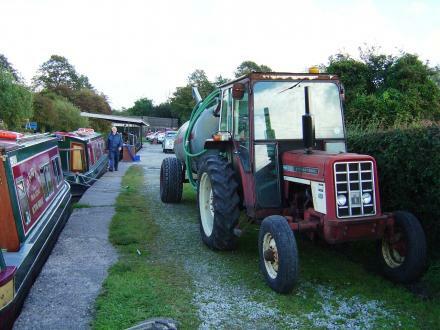 Facilities: diesel for sale and boatyard pump-out. Northwich — 1031 yards to the south. Warrington Road, Northwich, CW9 6JD — 330 yards to the northeast. Bridge Farm Warrington Road, Northwich, CW8 4 — 101 yards to the southwest. 1 Weaver Hses, Northwich, CW8 4QT — 443 yards to the south. Tarporley Rd, Warrington, WA4 4EZ — 1161 yards to the north. Bridge Farm, Warrington Road, Northwich, CW8 4QU — 101 yards to the southwest. Warrington, WA4 — 1040 yards to the northeast. St Mary Street, Latchford, Warrington, WA4 1EL — 1040 yards to the northeast. Warrington, WA42RT — 1040 yards to the northeast. Bartington Wharf, Warrington Rd, Northwich — 17 yards to the southeast. West Leigh Heath Lane, Northwich, CW8 4RH — 1482 yards to the northeast. 1611 yards to the southwest. Bridge Farm, Warrington Road, Northwich, CW8 4QU — 112 yards to the southwest. Old Warrington Road, Northwich, CW9 5LH — 185 yards to the southwest. Warrington Road Little Leigh, Northwich, CW8 4QT — 518 yards to the south. Northwich, CHESH IRE — 105 yards to the southwest. Acton Lane, Northwick, CW83 — 1341 yards to the southwest. Little Leigh, Northwich, CW8 4QY — 674 yards to the northeast. Tarporley Road, Lower Whitley, Warrington, WA4 4EZ — 1225 yards to the north. Northwich — 1597 yards to the southeast. 11 Partington Square, Runcorn, CHESHIRE — 1044 yards to the northeast. Chester — 1088 yards to the south. Northwich, CW8 3 — 1321 yards to the west. Northwich, CW8 4 — 190 yards to the west. Bridge Farm, Warrington Road, Bartington,, Northwich, CW8 4QU — 98 yards to the southwest. Northwich, CW8 4 — 449 yards to the south. Warrington, WA4 — 1004 yards to the northeast. Warrington Rd, Northwich, CW8 3QB — 1422 yards to the south. Runcorn — 1044 yards to the northeast. Northwich — 43 yards to the south. Warrington Rd, Northwich, CW8 3QB — 1215 yards to the south. 27 Chapel Lane, Northwich, CW8 3QS — 1562 yards to the southwest. Warrington Road Little Leigh Northwich, Chester — 330 yards to the northeast. 19 Warrington Road Acton Bridge, Northwich, CW83 — 928 yards to the south. Northwich — 1599 yards to the south. Dutton hall, Warrington, WA44LH — 1580 yards to the northwest. Volver Cottage Northwich Rd, Warrington, WA4 4HB — 1090 yards to the north. Northwich — 539 yards to the south. Parish Rooms, Hill Top Road, Acton Bridge, Northwich, CW8 3RA — 1574 yards to the south. Tarporley Road, Warrington, WA4 4EZ — 1147 yards to the north. Cheshire Natural Health Clinic, Stretton, Warrington, Warrington, WA4 — 1040 yards to the northeast. Northwich — 659 yards to the northeast. Weavervale Park, Northwich, CW8 4QU — 177 yards to the northeast. 1110 yards to the east.